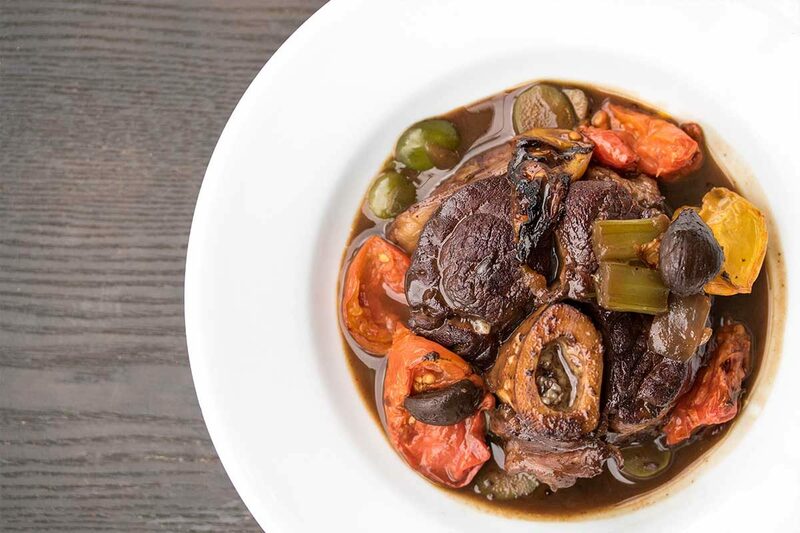 Exquisitely tender with bold flavors of veal, olive, tomatoes & black garlic, this simple braise gives you extraordinary results. Tie tight loops of butcher’s twine around each piece of osso bucco to hold the meat to the bone (this improves your final presentation). Season each piece with salt & pepper, then sear them in an oiled deep stock pot, turning occasionally, until they develop a nice brown crust on all sides. Unwrap the cloves of black garlic from the bulb. Cut the meat off of the olive pits (snack on the pits with the meat still clinging on them!). Preheat your oven to 300°F (convection if possible). Put the tomato pieces on a baking sheet. Drizzle them with the olive oil and sprinkle them with black truffle salt. Toss to coat. Move the baking sheet to the oven & roast the tomatoes for an hour. Remove the osso bucco from the skillet, then add the carrots, celery & onion to the residual fat in the pan. Deglaze the pot with the red wine, scraping the bottom to release the fond. Return the osso bucco pieces to the pot along with the olive pieces, bay leaves & thyme. Add the chicken stock. Add the roasted tomatoes & any collected juices to the braising liquid. Remove the osso bucco and simmer the braising liquid until it reaches a sauce thickness. 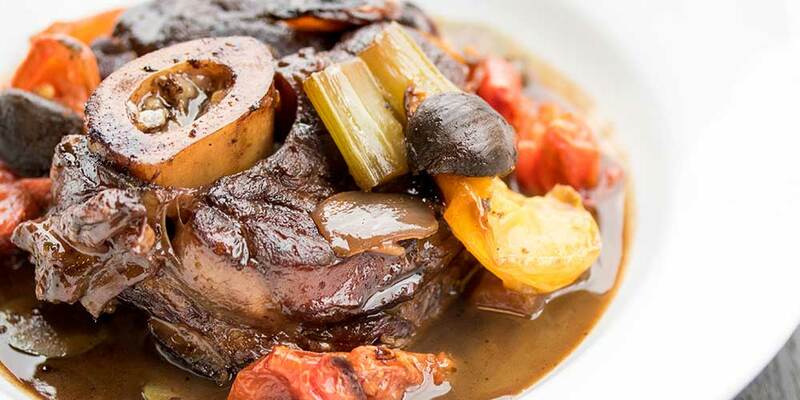 Serve the osso bucco with the braising liquid sauce and vegetables.